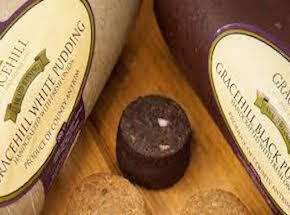 Hugh Anderson was a Meat Hygiene Inspector before he started Gracehill Puddings about 8 years ago. He does the pudding thing the time-honoured way with no pre-mix used. He only buys ingredients from local suppliers. Initially the business was a sideline but it became so popular that he had to give up his job to concentrate on it. Chef Chris Fearon used the Black Pudding in an apple fritter for the BBC’s Great British Menu programme in 2012. The puddings have also featured on UTV’s Great Food Adventure with Jenny Bristow and Barry McGuigan and BBC Radio Ulster’s Saturday Magazine show with Paula McIntyre. Sales are increasing year on year. This is the real deal, so when you see it, get it!